Royal disaster relief kits were distributed to residents in Phu Piang and Muangnan district of Nan province after the areas had been hit by a summer hail storm on April 16. Following HM the King’s great concern the President of the Rajaprajanugroh Foundation under Royal Patronage, Ditsatorn Watcharothai and a team of Foundation workers visited affected areas to present the royal relief kits to storm residents on April 19, 2011. Residents from 68 storm-hit houses were granted the royal disaster relief kits from the foundation at the Phu Piang district hall. The kits contained rice, dried food and other necessities. Most of the affected people are farmers living in poverty. Phrae was also hard hit by storms and Phrae Governor Chian Sirinanporn and his wife Sumalee President of the Phrae Red Cross, visited storm hit areas in Ban Pong and Huay Mai on April 19 to inspect the hard hit areas. The Governor instructed the Phrae Disaster Prevention and Relief Office to help residents repair their homes damaged in the storms. Strong winds and hail in a summer storm on April 17 caused damage to around 20 homes in Pong and 33 houses in Huay Mai. Additionally around 20 rai of corn fields were damaged. The Governor asked citizens to keep abreast of Meteorological Department warnings and to strengthen their homes and public salas to provide shelter to passersby when storms hit. 150 people suspected of being illegal workers were rounded up by Chiang Mai police on April 19 at the Sri Mongkol and Atsadathorn intersection in the Muang District of Chiang Mai. Police from Chang Puak Police Station were joined by officials of the Chiang Mai Employment Office after complaints from local residents of large numbers of workers waiting for employers to pick them up were received by the police Pol. Col. Monthon Panyayong reported. Only 10 of the 150 people were found to be illegal however, while another 30 were detained as their documents required further inspection. Mostly Tai Yai, 110 of the people were released after proving their legal status. The government expressed concern that a large number of illegal aliens are living in Chiang Mai and that some of these people commit crimes, further inspection will continue. The famous Phayao Buddha statue Phra Chao Ton Luang suffered no damage from the March 24 earthquake but will need renovation due to humidity damage. 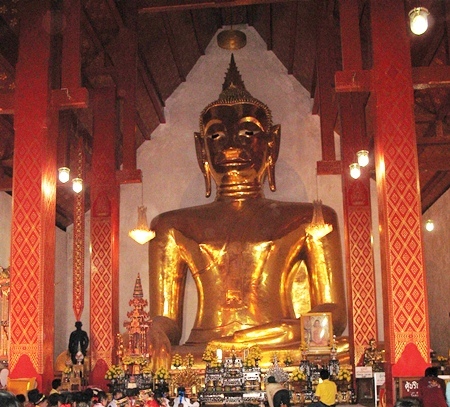 The Fine Arts Department sent experts to inspect the famous Phayao Buddha image at Wat Sri Kom Kam in Wieng District of Phayao on April 19 to survey any possible damage following the March 24 earthquake. Methadol Wijakkhana, Director of the 7th Fine Arts Office, Kittipan Parnsuwan, of the Archaeology Office and Noppadol Poochai, Head of the Phayao Office of National Archives reported that the earthquake had not caused any damage to the statue but expressed concern that the humidity was causing the outer surface of the statue to erode. Kittipan said that the statue can be re-covered with lacquer and gold leaf but that the pagoda structure needs to have a better ventilation system in order to reduce humidity. The team will come up with a plan for this and submit it to the Ministry of Culture for budget allocation. The inspection crew also visited many other historical sites in Phayao to survey for any earthquake damage. Other ancient sites in the province also need renovation and repair including the Buddha statue at Wat Analyo and the Phayao National Archive building. The Director expects that the Cabinet will approve the budget to renovate these ancient statues and buildings. Prime Minister Abhisit Vejajiva paid a visit to Mae Hong Son and stressed the need for treating all aspects of the drug problem in Thailand, from trafficking to drug use. Prime Minister Abhisit Vejajiva visited Mae Hong Son on April 25 and noted that drug suppression measures cannot be successful so long as demand in Thailand remains high and that it is important to tackle the cause of drug use in order to fight the drug problem in Thailand. He said that the Government has a policy to eliminate drugs from all aspects of Thai society by implementing five measures to prevent and stop drug trafficking with Mae Hong Son a key area of focus due to the amount of drugs smuggled over the Myanmar border. He noted that all sectors must cooperate to help solve the problem and that focus must be given to prevent drug addiction among the youth. He also visited Ratprachanukroh School in Mae Lanoi district, to observe recent implementation of government policy on village public heath volunteers work. He visited Boripatsueksa school in Mae Sarieng district, meeting with people at the Chormjaeng market before travelling back to Chiang Mai and then to Bangkok. 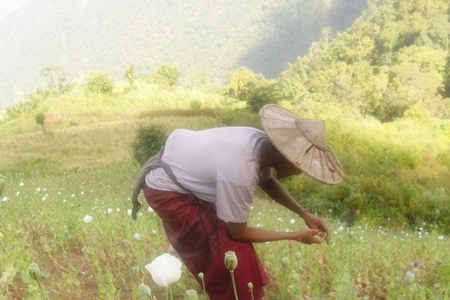 Opium poppy cultivation continues to expand in Myanmar districts opposite Mae Hong Son. In this first part of a two part series on the drug situation in the North, the cultivation of opium poppies is discussed, the second part will focus on transit routes and obstacles confronting authorities in confronting drug traffickers. The Border Patrol Police (BPP) and military intelligence agencies report that the areas opposite Mae Hong Son’s Pangmapha District and Ban Pangkong Pass specifically have seen increasing cultivation of opium poppies. The BPP sources report that Ho Main District in Lang Khoi Province of Myanmar has seen more than 5,000 rai of land opened up for cultivation of the poppies and that they are under the control and supervision of the Southern Shan State (SSS) and the United Wa State Army (UWSA). The sources added that Pa-o hill tribe villagers have indicated the poppy fields have been expanding since 2008 under the direction armed forces of the SS led by a Major who was the leader of the Ban Ho Main village as well as Lisu man from Pai who has been hiding in Myanmar to escape drug charges in Thailand. They added that Myanmar government soldiers have cooperated with the SSS collecting tax on the output. The raw opium is sold at 25,000 Baht per joi or 1.6 kg. It is then delivered to heroin refineries under the control of the UWSA in Ban Khailuang opposite Tambon Thamlod in Pangmapha District of Mae Hong Son. Prior to 2008 the opium was sent to central parts of the Shan state in Doi Laem Province under the control of the Myanmar government and the Red Pa-o or SNPLO. However, since then the opium is being sent to the Red Wa as they offered higher prices. The heroin refineries in Myanmar are concentrated in four key areas; Ban Nayai in Shan State, belonging to former Muan Tai soldiers under the former heroin kingpin Khun Sa and Chinese Haw; Ban Nong Tao also in the Shan State under the control of the Red Pa-o; Ban Rongmak-o in Langkua Province opposite Ban Pangkong Pass under the control of the UWSA; and Ban Kongthewee in Ban Khailuang of the Shan State opposite Ban Kailuang Pass in Mae Hong Son under the control of the Red Wa. Main transit routes are found at Ban Huay Pueng Pass and Ban Huaysan in Muang District Mae Hong Son, Ban Harndred Pass, Ban Maisangnam, Ban Pangkong Pass, Ban Huarang in Pangmapha District of Mae Hong Son, Pai District in Mae Hong Son and Galyanivadhan District and Mae Taeng District of Chiang Mai. Carol Buckley has dedicated her life to helping elephants live a natural life. So much around us here in Thailand involves the elephant, and indeed this great creature is a symbol of the country. Sadly, an endangered symbol that more often than not, is mistreated and abused. Carol Buckley is a woman who loves elephants. She said she was initially interested in exotic animal training when, one day in the town where she went to college in Southern California, she saw a baby Asian elephant walking down the dusty road. Fluffy was her name and she was working as an attraction for some store in town. Carol said she volunteered to help take care of her and from that moment on her love of elephants was born. She helped to co-found the Elephant Sanctuary in Tennessee, many may know it for the famous story of the elephant, Bella and her best friend Tarra. The Elephant Sanctuary is a place for retired elephants and they often pair up as elephants are a social creature more used to living in families then alone. Bella, however, paired up with Tarra and the two friends are inseparable. Carol is also the founder of Elephant Aid International, an organization working to promote humane, non-dominant methods of training as well as teaching the importance of foot care and the need for proper food and care for elephants. The problem lies in the fact that elephants are supposed to roam over vast areas. They are a vital part of the eco system in which they live, foraging allows the trees to thrive, they clear areas that bring in sunlight and their droppings fertilize. “You see trees growing out of a pile of elephant manure,” Carol noted. A healthy elephant leading a normal life will forage when needed and the walking will keep the foot pads healthy. However, many elephants are fed a concentrated feed, like cows, which doesn’t provide the natural roughage they need and being confined to small spaces causes their feet to develop ingrown toenails and ingrown skin. And while Carol reflects the reality of the elephant in Asia is the ever decreasing spaces allowed to them, she said it is of vital importance that they be allowed to walk and stay off hard surfaces that can lead to major feet problems. She noted that they can develop osteomyelitis, or bone infections, from standing too much on hard surfaces. This can take years to develop and years to eventually kill the animal as it slowly loses bone mass, and toes then parts of it feet. Eventually, she said, they can no longer stand and while there is nothing wrong with their body, the legs and feet can no longer support them. Either they are put down or eventually die what is a long and painful death. She noted this is prevalent in the West where 3 out of 4 elephants will eventually die from this and hopes to prevent this from occurring in Asia by teaching not only the needs of the elephant but also proper foot care for the elephants. Her enthusiasm for all things elephant is clear and her care and love for these giant animals shines through. The importance of humane and gentle training for elephants is regularly stressed, she also noted that the brutal breaking of a young elephant is not necessarily an Asian thing as many in the West will use cattle prods to break young elephants for training. She has just returned from trips to Nepal and Sri Lanka where she has been working with mahouts on training and foot care and from India where the Foundation is working on elephant care centers. In 2008 the Indian Government mandated that all elephants be removed from zoos and be placed in alternative facilities better suited to address their needs. However, there are not enough national parks or sanctuaries for this, so the Foundation is working to start a series of elephant care centers. In Thailand she visited the Elephant Nature Park here in Chiang Mai to teach foot care and work to instruct mahouts on new methods of training as well as the newly established Elephants World in Kanchanaburi and the Wildlife Friends of Thailand’s Elephant Refuge and Education Center in Petchaburi. She said she believes the future will be better for elephants in Thailand, she notes that it won’t be an overnight change, as, “nothing ever is” but attitudes are changing and that as attitudes change the government will also follow suit and, hopefully, one day, enact laws to protect the captive elephants and this country’s national symbol and ensure their humane treatment. 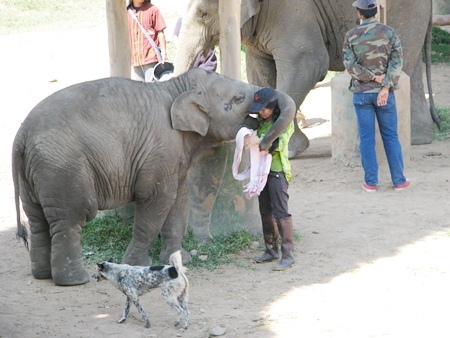 The Elephant Nature Park in Chiang Mai and it’s founder Sangduen “Lek” Chailert, seen here with one of the young elephants that live there, was one of Carol’s stops where she enjoyed working with the elephants and mahouts. Roshan is seen here in her tireless work help dogs in Chiang Mai with Lanna Dog Rescue. 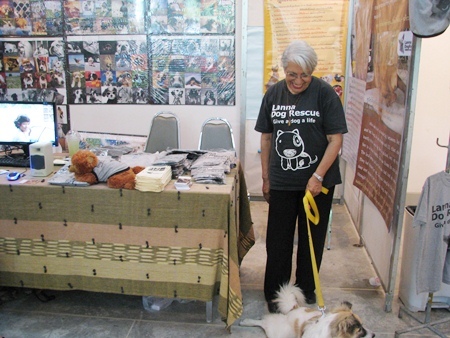 Roshan Dhunjibhoy dedicated her retirement years to Lanna Dog Rescue since her arrival in Chiang Mai in 1999. Prior to that she was a documentary film maker in Germany with her German husband and traveled the globe. She also studied acting, spoke 4 languages fluently, including German, French, English, and Urdu, and moderate Thai. She lived in Pakistan, France, India, Germany and Thailand. For a while she worked with an organization to help oppressed women in Pakistan. 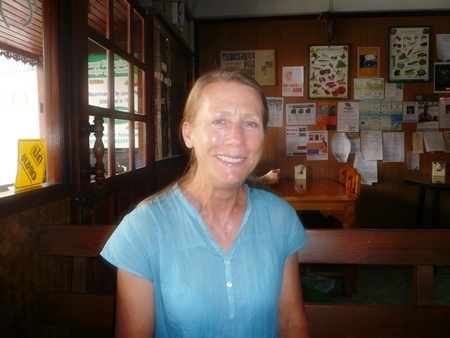 In Thailand she dedicated her life to dogs and started the Lanna Dog Rescue that became the first organization who, with the help of local governments, initiated a regular program to sterilize and vaccinate street dogs. She visited local temples to feed and treat sick dogs. Services will be held at Wat Pa Paeng May 7 and 8, please contact Lanna Dog Rescue for details. The “seven dangerous days” of Chiang Mai Songkran during April 11 – 17 ended with 11 deaths ranking Chiang Mai 4th in the national death toll. The Chiang Mai Governor will aim for a lower number of fatalities for the next long weekend. 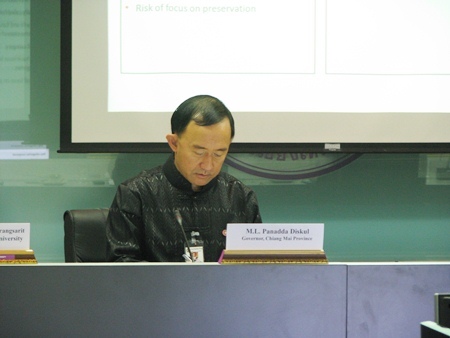 This was an 8.3% drop from last year, Chiang Mai Governor ML Panadda Diskul noted at the closing meeting of the Songkran 2011 Road Accident Prevention Center. 9 of the victims were male and out of 88 injuries, 67 were male and 21 female. There 92 accidents during the 7 dangerous days of Songkran. The main cause of accidents was drunk driving while unsafe motorcycle riding and speeding were the other causes. All of the dead were local Chiang Mai people with no tourist deaths recorded. 4,000 drivers were caught at checkpoints during the holiday season. Excise officials arrested 56 sellers of alcohol for selling without a license and 77 drunk people were caught. The Governor said that while the reduced accidents was a good move in the right direction, the Province will prepare for Loy Krathong and New Years by offering rehabilitation courses for repeat offenders and other training courses. 5 districts in Chiang Mai reported no accidents and the Governor said the Province would reward these districts for their efforts in preventing road accidents. A severe summer storm struck 3 districts in Chiang Mai on April 18, affecting 105 villages in 10 tambons and damage to numerous crops and homes. Mae Wang, San Patong and Doi Tao districts saw the most damage with 39 villages in Mae Wang affecting 3,754 households, while San Patong saw 2,330 households affected in 32 villages and Doi Tao had damage in 34 villages. People in damaged areas were visited and assisted by local administrative officers. Local construction materials vendors were contacted by the officers to repair infrastructure according to the head of Chiang Mai Provincial Disaster Prevention and Relief Prajon Prachasakul. 3 villages in Phrae saw damage from hail storms on April 17, causing damage to 33 houses with 3 houses completely destroyed and 20 rai of damage to area corn fields in Huai Mai in Song District, Phrae Governor Chuan Sirinanporn reported after surveying the damage. 20 houses in Baan Pong Hua Hard in Soong Men District were damaged and the Phrae Provincial Red Cross visited the village to provide relief kits. The Northern Meteorological Center has warned that severe summer storms could occur frequently as high pressure has been covering the Kingdom and temperatures remain high. This causes many areas to have strong winds, rain and even hail. The Public Relations Department (PRD) announced the launch of a new television station run by the PRD, PRD, Region 3 Office Director Mrs. Jintana Singsuramet announced recently. Mrs. Laddwan Bua-iam, the Deputy Director General of the PRD, noted that TV Channel 11 is a public channel and it needs network members to help it develop. She added that the public should give feedback to improve TV programs. The new television station will offer 18 hours of programming under the “Dream Art Academy” along with Radio Thailand and Butterfly Record Co. to present programs that encourage the arts and offer improvement of skills through a variety of entertainment programs. The second project that the PRD announced is the launch of the “Eco Town Eco Tour which Surachai Jongrak, Permanent Secretary of State for Chiang Mai Provincial Authority, Prayard Anantapradit, the head group of environment work of the Chiang Mai Provincial Office of Natural Resources and Environment, and Assoc. Prof. Dr. Pongthep Wiwattanadej, the Head of Community Medicine, Faculty of Medicine, Chiang Mai University are working together on the project. This project is in conjunction with the PRD, Region3, and Mae Hong Son Provincial Office of Natural Resources and Environment, as well as its Offices in Chiang Mai, Lampang and Lamphun, to help promote environmentally friendly policies and make town living more friendly and amenable. The number of road accidents in Chiang Mai during the Songkran festival from April 11-16 saw a decrease when compared to last year because of the ‘integrated promotional campaign” according to the Land Transport Department and Chiang Mai provincial officials. They said the stepped up measures to check blood alcohol content of drivers, and road check points were a factor in the lower numbers this year. Chiang Mai saw 83 injuries and 9 deaths from road accidents this year, lower than last year’s 130 injuries and 11 deaths. Five people were arrested for alcohol sales during the festival, while 78 people had their blood alcohol content checked and were charged when it was found above the limits. Chiang Mai Police also cracked down on safety laws; charging 473 people with not wearing a helmet on a motorcycle, 386 people were charged with not wearing seat belts in cars, and 818 people were found to be driving without a license. Officials from the Road Accident Prevention and Safety Control Operations Center said that high speed, reckless driving and drunk driving were the main cause of road accidents. During April 11- 14 Mae Hong Son also saw a reduction in the number of road accidents when compared to last year. This year saw 19 injuries and no deaths while last year there were 29 cases mostly caused by drunk driving and reckless driving according to Thaweesak Wattanathamaraks, Deputy Governor of Mae Hong Son, acting as director of the Safety Control Operations Center in Mae Hong Son. Nationwide 271 people were killed and 3,476 others injured in 3,215 road accidents from April 11 to 17, the Disaster Prevention and Mitigation Department reported Monday, April 18, 2011. 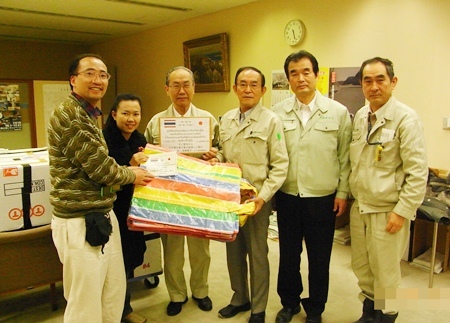 Tomoharu Abihara, left, the Foundation director and Mrs. Niramil Abihara, a Foundation Committee member presented donations and money to Mr. Mitsuya Aizawa, 3rd left, committee and council members of Miyagi Council, at its prefecture offices on April 11. On the one month anniversary of the Japanese quake and tsunami disaster committee members of the Thai Japan Education Foundation travelled to Japan to offer donations to survivors as well as give greetings and cards from the people of Chiang Mai for Mitsuya Aizawa of the special committee on Quake Disaster of Miyagi Council prefecture, and Mr. Kazuyoshi Hatakeyama, the council chairman of Miyagi prefecture to distribute to those affect4ed in hard hit Miyagi Prefecture. The Foundation committee also visited the quake and tsunami-hit areas, and new settlement areas in Miyagi, Japan. 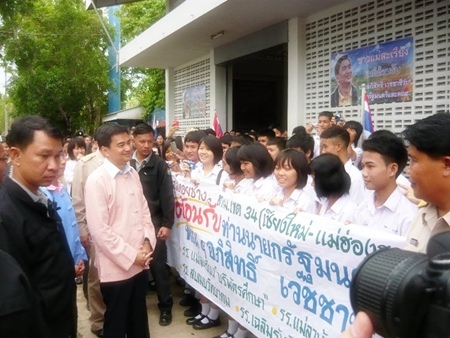 The Thai Japan Education Development Foundation collected more than half a million baht between March 12-31 as well as goods and necessities for the survivors of the disaster. Foundation staff, Chiang Mai University staff, and Naresuan University researchers were supported by Mr. Tetsuo Ando, the business operator at Sendai and NGOs staff when they visited the disaster hit areas, including Miyagi prefecture. For more information: please contact Thai-Japan Education Development Foundation (TJEDF). http://tjedf.com/. [email protected] 081-972-9863. Guests join organizers Jason Tamthai, Preeya Pramukkul and Tamarind Village General Manager Naphat Nutsati for the event at the resort. A charity fundraiser held at the Tamarind Village on Sunday April 10, 2011 to help villagers affected by the severe floods in Southern Thailand this month. 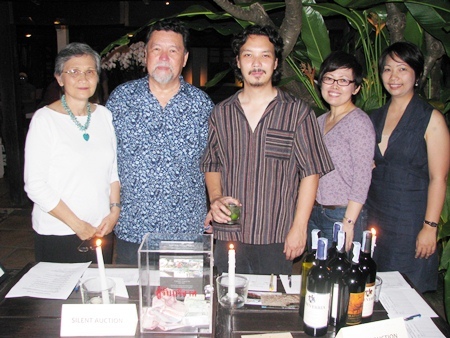 More than 40,000 baht was raised at the event which featured a silent auction with donations by Tamarind Village, Wine Gallery, Banthai Village, 2nd Floor Gallery, The House & Ginger, Rayavadee, Anyawee and Best Western Krabi, AKA Hua Hin, D2, and Azaya Villas. The donation was given to Dr. Wuttisak Pitsuwan of the Prateepsasana Foundation for Educational Development (PFED) for distribution to affected villagers. The Northern Province of Nan saw hail storms and strong winds and rain damage more than 200 houses and cause serious agricultural damage in the evening of April 17, 2011. The sudden struck hard, with hail reported in Muang and Phupiang Districts damaging houses, rice barns and fruit trees and stored crops. Lamyai and mango trees were damaged with blossoms knocked off, rubber trees saw damage and harvested and dried soybeans were destroyed in the storm after getting soaked with water. Homes saw rooftops blown off, and the wind knocked down trees into houses and electricity poles causing a blackout in the two towns. Nien Luangrit, Deputy President of Na Pang Tambon Administrative Organization in Phupiang District reported that officials are inspecting damages and will ask for more financial help once the estimates are made. Mr. Thawat Phetveera, the head of the Nan Provincial Public Disaster Relief and Prevention Office noted that they could ask the Governor to approve an emergency budget of about 50 million baht to help people initially.